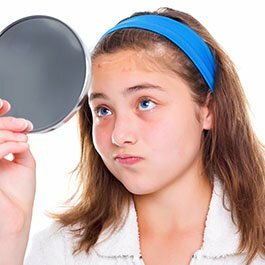 It is the most disturbing problem at puberty when the young persons of both sexes, see pimples appearing on their face. If plucked/broken, blood/pus out from pimply eruptions which leave back black scars on the face. Skin’s sebaceous glands get activated due to hormonal activity. If skin is too much oily more lubricant is released due to hyperactivity of glands, which, in turn, infects and blocks hair follicles. The young persons arc advised not to break/squeeze the erupted spots, otherwise the infection will spread to the surrounding areas (of tissues). If acne persists even beyond pubelty, professional help will be needed. Persons with oily skin are more likely to suffer from severe infection.